PATRICK KLUIVERT HAS left Paris Saint-Germain by mutual consent after spending a single season as the Ligue 1 club’s director of football. 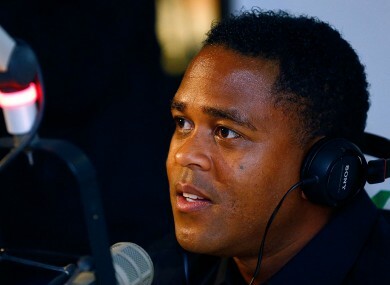 Former Netherlands, Ajax, Barcelona and AC Milan striker Kluivert was appointed to the role in July 2016 but presided over a disappointing debut campaign for coach Unai Emery. PSG’s dominance of French football was ended in stunning fashion by Monaco, who Leonardo Jardim led to the Ligue 1 title, although PSG won the Coupe de France and Coupe de la Ligue. President Nasser Al-Khelaifi has backed Emery to continue as PSG’s coach, but the club has replaced outgoing sporting director Olivier Letang with Antero Henrique in a period of upheaval at the Parc des Princes. According to French sports daily L’Equipe, PSG had offered Kluivert a lesser role, but the former Ajax, AC Milan and Barcelona striker declined. “The club would like to underline the quality of the relationships Patrick developed, over recent months, with the senior-team players and staff as well as with the administrators, educators and players at the youth academy and their families,” a PSG statement released on Friday read. Email “Former Ajax and Barca great Kluivert ousted at PSG”. Feedback on “Former Ajax and Barca great Kluivert ousted at PSG”.